At the top end of the motel strip in Radium Hot Springs, Misty River Lodge provides an excellent base for travelers on a budget. Also known as Radium Hot Springs International Hostel, this converted motel has 11 beds in dormitories and private rooms that include a room that combines valley views with a full kitchen. 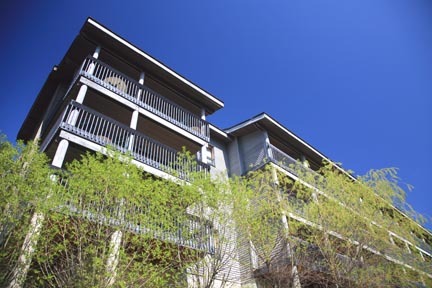 Amenities include a communal kitchen, a lounge, and a big deck with even bigger views to the distant Purcell Mountains. Guests can also rent bikes and canoes. Elsewhere on this website, we’ve listed hotels by prices, but as the Columbia Valley covers a wide area, we’ve listed them on this page geographically from north (Radium Hot Springs) to South (Cranbrook and Fernie). Radium, with a population of just 900, has more than a dozen motels, an indication of its importance as a highway stop for overnight travelers. Those that lie along the access road to Kootenay National Park come alive with color through summer as each tries to outdo the others with floral landscaping. In the middle of this motel strip is the Alpen Motel, which arguably has the best and brightest flowers out front. The air-conditioned rooms are the best along the strip, which is reflected in the price, which includes passes to the hot springs. Three kilometers (1.9 miles) south of Radium Hot Springs, Radium Resort is surrounded by an 18-hole golf course and holds a wide variety of facilities, including a health club, indoor pool, restaurant, and lounge. Guest rooms overlook the golf course and are linked to the main lodge building by a covered walkway. Regular motel rooms range $175 to 210 s or d, while kitchen-equipped condos sleeping up to six people start at $265 per night. Check the website or call for specials (rooms are often sold for around $120, even in the middle of summer). Additionally, golf, ski, and spa packages lower rates considerably, especially before and after summer’s peak season. Trickle Creek Lodge is at the base of Kimberley Alpine Resort. This contemporary log and stone structure holds 80 spacious rooms, each with a full kitchen, balcony, and fireplace. Guest facilities include a fitness center and a year-round slopeside outdoor heated pool and hot tub complex. 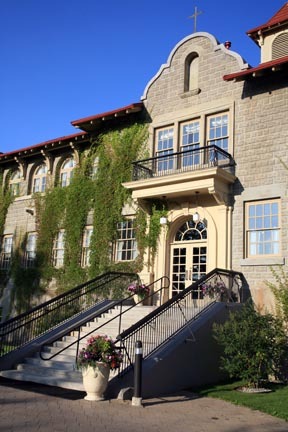 North of Cranbrook, out near the airport, the Ktunaxa nation have transformed an abandoned mission building into the sprawling St. Eugene Golf Resort & Casino. Surrounded by rolling farmland and with distant views to the Canadian Rockies, it’s a beautiful property, complete with a golf course, outdoor swimming pool and hot tub, casino, and a restaurant and bar. The motel-style rooms are comfortable and spacious. In the heart of Cranbrook’s commercial strip, Lazy Bear Lodge is an old roadside motel snazzed up with log trim, beds of bright flowers, and a colorful coat of paint. The rooms remain basic, but each has a coffeemaker, and some have a fridge and microwave. Out front is a small swimming pool for guest use. Excellent value. Best of a bunch of motels in Fernie for budget-conscious travelers is Powder Mountain Lodge. This renovated motel has a game room, loads of parking, a laundry, free wireless Internet access, and an outdoor pool.